What is the use-by date for a blog or maybe that should be a beer or bar blog? No sooner had I recovered from the news of Tipples pulling up stumps, than I read that Bar Zine (unbiased views of Sydney bars) is having an extended break. You can read the full post here, but if you are a patriotic Sydneysider, one of the reasons will make you swell with pride. Put simply, Bar Zine’s view is that there are now enough sites reviewing Sydney bars, which also means there’s a growing bar culture in Sydney, which didn’t really exist a few years ago. Whilst Bar Zine concentrated on cocktails, the bars he broke (many times the first time I heard about a bar was through Bar Zine) are also doing great things with beer lists (Grasshopper aside). In one of Bar Zine’s last articles, he nominated his Top 10 bars. Perhaps a little surprising, given that it’s been open for less than two months, but perhaps not so surprising given that it is simply brilliant, is the inclusion of Frankie’s Pizza. 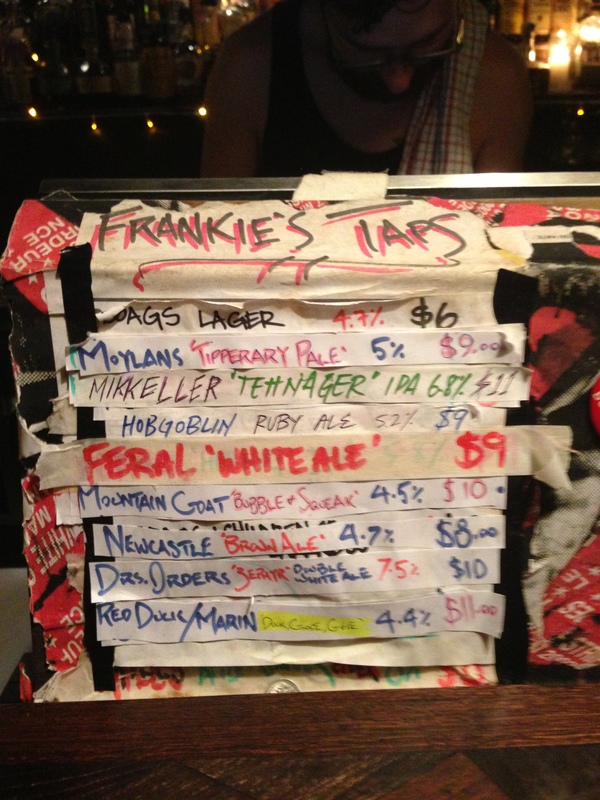 Now, BotF doesn’t really like repeating itself (we really try to not repeat a beer in a post), but last Wednesday’s beer list at Frankie’s was pretty special. Deer, Goose, Gose is a collaboration from California’s Marin Brewing Company and Victoria’s Red Duck. The boys behind the bar said that it would be salty. It sort of was and was quite unusual. The Full Pint provides the best explanation, but the beer is a crack at a unique style of beer from Germany. The second beer we tried wasn’t even on Untappd. Mikkeller’s Tehnager is an IPA. A 6.8% smooth, hoppy beauty. A beautiful red colour – this was voted an Untappd 5 by my Melbourne companion and BotF member Cam. His reaction to the new underground bars of Sydney backs up what Bar Zine is saying. 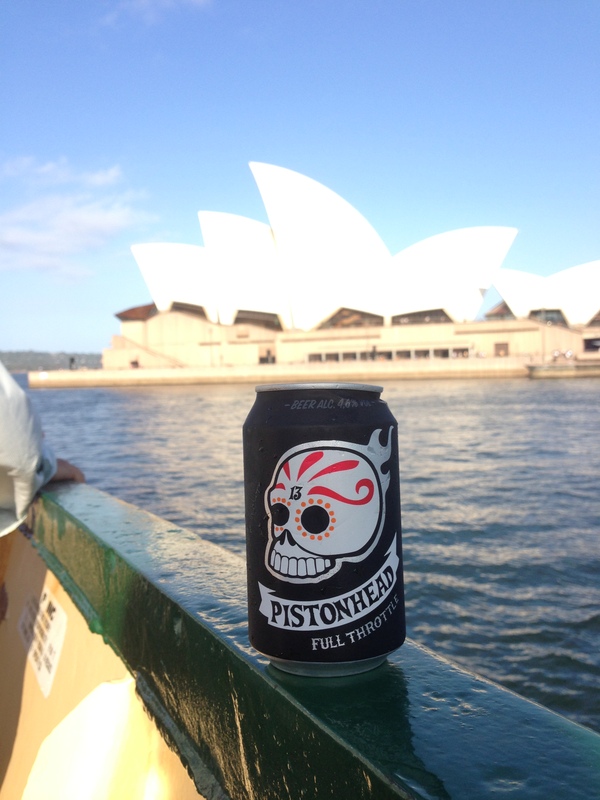 Pistonhead Full Throttle would have to be one the cooler looking cans I’ve seen for awhile. It comes from Sweden – a country not known for its beers. This beer is probably not known for its taste, but rather its appearance. Even the top of the can is cool looking like a hub cap. It was a perfect summer slam for the back of the ferry on a steamy hot day – but you can probably pay less for the same sort of thing.